Owing a big departmental store or supermarket makes you more responsible and if you are using the best lights inside the coolers, you are definitely helping your company in growing its business manifolds as with the correct lighting you can make your products more noticeable and highlighted. For the same purpose, you can use LED cooler tubes to make the food items look fresher. •Mostly the temperature inside the freezers or coolers reaches to below zero degree where it becomes difficult for the fluorescent tubes to sustain, but if you select these LED cooler tubes they can surely withstand low temperatures as well. •The lumen produced by a 6ft LED cooler tubes is more than 4800 with colour temperature of 5000K that produces a neutral white-day white light colour glow making your products look more attractive. •Comes with a wider Beam Angle of more than 180 degree that can even make the food merchandise kept at the extreme corners as well more clear. 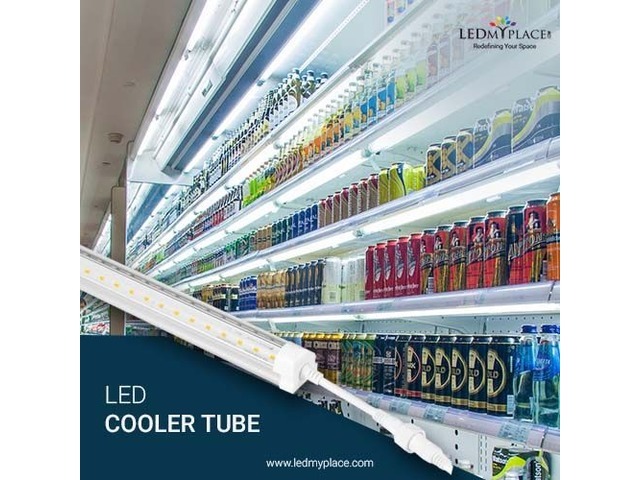 •These LED cooler tubes have Poly carbonate finishing that make them more durable to withstand all kind of difficult weather conditions and they are made with zero glass, hence there is no risk of glass breakage as well. •You will get IP54 rating on these cooler lights that will protect them from all kind of dust and water coming from any direction. 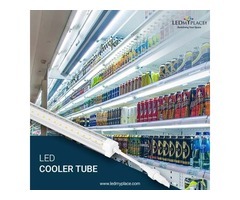 So in addition to attractive displayed food items for your warehouse or departmental stores, you need these smart and eco-friendly LED cooler tubes that once installed will work for almost 50,000 hours.